Posted September 30th, 2010 at 3:02 pm. On Wednesday, Oct. 6, Eugenia Chase Guild Professor in the Humanities Dale Kinney will be honored by current and former students from around the country—including Alicia Walker ’94, who will take Kinney’s place on the history of art faculty next year—at a daylong symposium in Wyndham’s Ely Room. As the seminar draws to a close, President Jane McAuliffe will host a reception honoring Kinney, who will retire at the end of the semester. Bryn Mawr students, faculty, and staff are invited to both the symposium and the reception. To attend the symposium, please RSVP to Sarah Bassett (sebasset[at]indiana.edu). Kinney arrived to teach at Bryn Mawr in 1972, receiving her Ph.D. in 1975 from New York University. Her research interests include medieval art and architecture from the fourth through 12th centuries, with a focus on Rome. 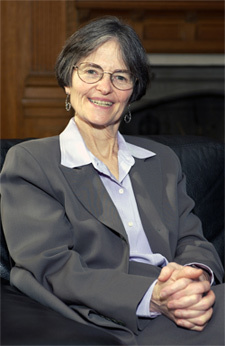 In addition to teaching, Kinney served as the Dean of the Graduate School of Arts and Sciences from 2000 to 2008. Kinney has taught on all levels of undergraduate and graduate education, lecturing in introductory courses and facilitating upper-level seminars. She has been recognized for her excellence in teaching by the Christian R. and Mary F. Lindback Award for Distinguished Teaching at Bryn Mawr (1984) and the College Art Association’s Distinguished Teaching of Art History Award (2002).